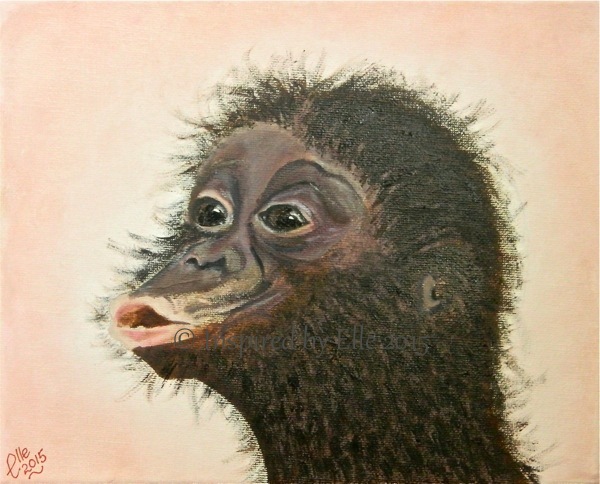 My most recent portrait was inspired by ‘The Bonobo’. I was captivated by the pouting chimpanzee image that I saw, as it so mimics a human-being. Then, after doing some research I realised that the Bonobo, which to me was an unknown species of chimpanzee, actually shares more than 98% of the same DNA as us. I look at the Bonobo and those BIG EYES jump out at me as they are so alive and knowing. Then, I started to read about how this animal is critically endangered, because of loss of their habitat and because man uses them for bushmeat. Conversely 50% of their diet is fruit. Equally they are often referred to as the “make love not war” chimpanzees as they use love to resolve conflict and to make up after conflict. It does beg the question as to why we cannot adopt their attitude of showing love rather than hatred. Strange that we originate from this primate, and actually need to regress to these principles to bring peace to the world. Furthermore, we believe we have evolved….?! Tell me your thoughts and opinions in the comments!